Mauro Musso has had two great loves over the course of his life: music and pasta. Are they two dissonant passions? Only by outward appearance. 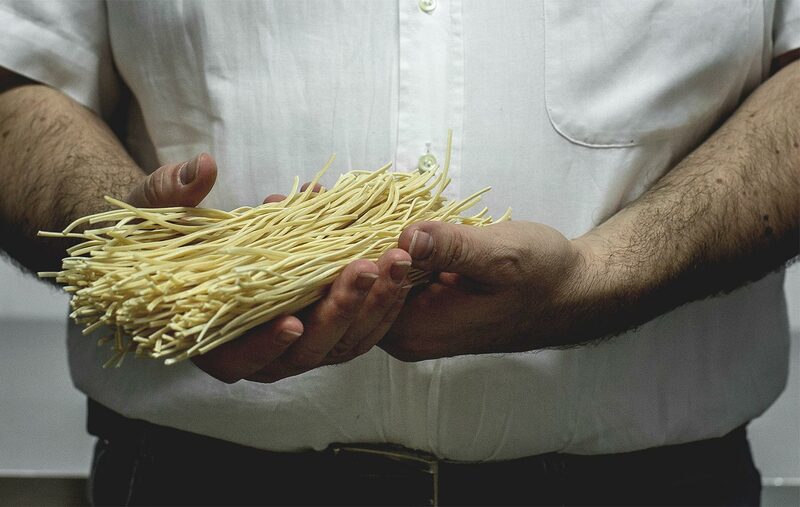 The tajarin pasta made by Mauro reaches the grand finale in perfect cadence, like a Beethoven concert. His favorite musician. When Mauro Musso entered the small, local church of his hometown at the tender age of six, he was carried away by the mysterious resonance of the organ. With the clarity of youth, he knew immediately that the magic sounds coming from the keys was his future. He began reading sheet music as though they were books. He had no doubt that he would become a concert pianist. At times, however, destiny is a tyrant; talent and certainty are not always enough. In 1993, at 26 years old, a serious problem with his hand forced him to quit piano playing and, along with it, his dreams and aspirations. Bereft of music, he descended into a period of unhappiness and bitterness. But his most difficult test was yet to come. Members of Mauro’s family have been farmers for generations. Their agricultural company had supported the family for over 80 years. But in 1994, severe floods arrived, washing away everything they had built their lives around: home, business, and land. Mauro’s priorities changed drastically. After the flood, he no longer had any certainties or possessions in life – only the need to find a job; and the only job he could find was as a janitor in a supermarket. The boring, monotonous work devoid of stimulus was his reality until 2008 – the year everything changed. Mauro’s mother has always been on the go. One Sunday, she simply did not have time to make the fresh egg pasta called tajarin – a typical pasta of Piedmont – for dinner. She gave Mauro peremptory instructions. The bella figura, or good impression, is of utmost importance when guests are coming to dinner; in the Langhe, it was unthinkable to leave tajarin off the menu. Mauro had no time to think twice, and he found himself, for the first time in his life, with his hands in pasta. It was a revelation, just like when he heard the organ music from church at six years old. His pasta-making stint followed with creating more tajarin, with mastery and a newfound passion. A baker friend gave him the idea. 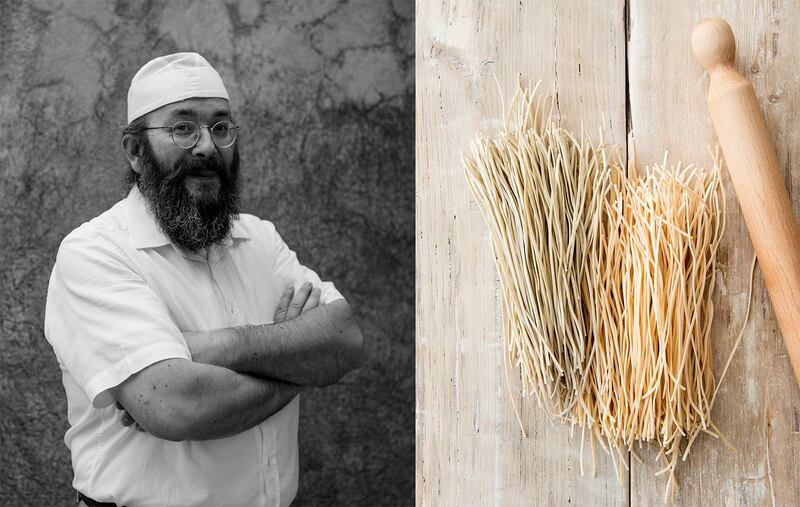 “You like making pasta, so make it your job.” Mauro met with cooks, viticulturalists, simple gourmands; he read books on biodynamic agriculture and permaculture, on herbs and pasta making. He has an obsession: genuineness. And he is happy. For the second time in his life, he found his passion. His new instrument, the pasta, is more clement than the piano and willing to make concessions for his imperfect hand. 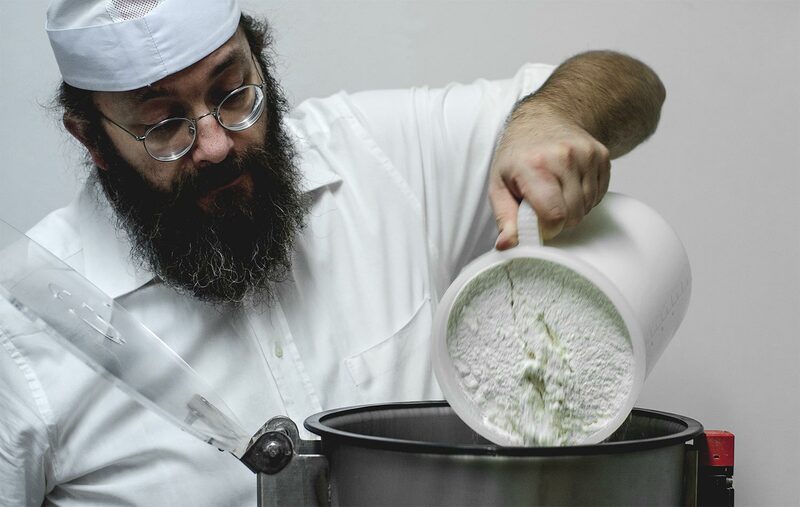 At 39 years old, Mauro quit his job at the supermarket with a new certainty: he wanted to make original, unique pasta using only the best ingredients. It would be delicious, easy to digest, and all-natural. He built a small pasta workshop at his house, located just outside of Alba, planning to have a small production. Proceeding by trial and error, he listens to the music of grain, giving kilo after kilo of pasta to his friends and taking into consideration all opinions and comments. His first obsession is the choice of raw ingredients: he only wants to produce pasta by using ingredients that follow the cycles of nature. He uses heritage grain varieties like durum wheat Margherito and spelt Monococco, which have not undergone hybridization or genetic crosses and are cultivated using zero chemical fertilizers. Almost without realizing it, he has created a national network of passionate farmers and millers. His other obsession is all about digestion. His concern for this has been the basis for his “Stravaganti” (“extravagant”) product line using aromatic herbs. He makes tajarin with herbs and spices that have been selected according to their properties that aid in digestion. He grinds the herbs himself and tests different quantities and combinations to find the best match of aromas and flavors. Mauro still works in his small, artisan shop right outside of Alba, without any extra help. When he wishes to taste-test his products, he heads upstairs to the kitchen that overlooks the hills of the Langhe. Here, he cooks his pasta and serves it with just a drizzle of olive oil. Italian and international chefs come to Mauro and his pasta, eager to use his handmade products that are slightly different every time they are made – because they are closely tied to the whims of nature. As for music? Great loves like that are never forgotten. Mauro continues to listen to concerts and tap away at the piano. Today, however, he is ensnared by other harmonies, those that he composes in his pasta.